Update: Also read A brief update on NUMA and MySQL. When running MySQL on a large system (e.g., 64GB RAM and dual quad core CPUs) with a large InnoDB buffer pool (e.g., 48GB), over time, Linux decides to swap out potentially large amounts of memory, despite appearing1 to be under no real memory pressure. Monitoring reveals that at no time is the system in actual need of more memory than it has available; and memory isn’t leaking, mysqld‘s RSS is normal and stable. Normally a tiny bit of swap usage could be OK (we’re really concerned about activity—swaps in and out), but in many cases, “real” useful memory is being swapped: primarily parts of InnoDB’s buffer pool. When it’s needed once again, a big performance hit is taken to swap it back in, causing random delays in random queries. This can cause overall unpredictable performance on production systems, and often once swapping starts, the system may enter a performance death-spiral. While not every system, and not every workload experiences this problem, it’s common enough that it’s well known, and for those that know it well it can be a major headache. Kevin Burton — Discussion of swappiness and MySQL on Linux. Kevin Burton — Proposed IO_DIRECT as a solution (doesn’t work) and discussed memlock (may help, but not a full solution). Peter Zaitsev — Discussed swappiness, memlock, and fielded a lot of discussion in the comments. Don MacAskill — Proposed an innovative (albeit hacky) solution using swap on ramdisk, and a lot more interesting discussion in the comments. Dathan Pattishall — Describes how Linux behavior can be even worse with swap disabled, and proposes using swapoff to clear it, but no real solution. Rik van Riel on the LKML — A few answers and proposal of the Split-LRU patch. Kevin Burton — Discussion of Linux Split-LRU patch with some success. Mark Callaghan — Discussion of vmstat and monitoring things, and a recap of a few possible solutions. Kevin Burton — More discussion that Linux Split-LRU is essential. Kevin Burton — Choosing the middle road by enabling swap, but with a small amount of space, and giving up the battle. Peter Zaitsev — More discussion about why swapping is bad, but no solution. Despite all the discussion, not much has changed. There are some hacky solutions to get MySQL to stop swapping, but nothing definite. I’ve known these solutions and hacks now for a while, but the core question was never really settled: “Why does this happen?” and it’s never sat well with me. I was recently tasked with trying to sort this mess out once and for all, so I’ve now done quite a bit of research and testing related to the problem. I’ve learned a lot, and decided a big blog entry might be the best way to share it. Enjoy. There was a lot of discussion and some work went into adding the relatively new swappiness tunable a few years ago, and I think that may have solved some of the original problems, but at around the same time the basic architecture of the machine changed to NUMA, which I think introduced some new problems, with the very same symptoms, masking the original fix. When the PC world first got multiple processors, they were all arranged with equal access to all of the memory in the system. This is called Symmetric Multi-processing (SMP), or sometimes Uniform Memory Architecture (UMA, especially in contrast to NUMA). In the past few years this architecture has been largely phased out between physical socketed processors, but is still alive and well today within a single processor with multiple cores: all cores have equal access to the memory bank. The new architecture for multiple processors, starting with AMD’s Opteron and Intel’s Nehalem2 processors (we’ll call these “modern PC CPUs”), is a Non-Uniform Memory Access (NUMA) architecture, or more correctly Cache-Coherent NUMA (ccNUMA). In this architecture, each processor has a “local” bank of memory, to which it has much closer (lower latency) access. The whole system may still operate as one unit, and all memory is basically accessible from everywhere, but at a potentially higher latency and lower performance. Fundamentally, some memory locations (“local” ones) are faster, that is, cost less to access, than other locations (“remote” ones attached to other processors). For a more detailed discussion of NUMA implementation and its support in Linux, see Ulrich Drepper’s article on LWN.net. Enumerates the hardware to understand the physical layout. Divides the processors (not cores) into “nodes”. With modern PC processors, this means one node per physical processor, regardless of the number of cores present. Attaches each memory module in the system to the node for the processor it is local to. Collects cost information about inter-node communication (“distance” between nodes). The number of nodes, and their node numbers — In this case there are two nodes numbered “0” and “1”. The amount of memory available within each node — This machine has 64GB of memory total, and two physical (quad core) CPUs, so it has 32GB in each node. Note that the sizes aren’t exactly half of 64GB, and aren’t exactly equal, due to some memory being stolen from each node for whatever internal purposes the kernel has in mind. The “distance” between nodes — This is a representation of the cost of accessing memory located in (for example) Node 0 from Node 1. In this case, Linux claims a distance of “10” for local memory and “21” for non-local memory. Each process and thread inherits, from its parent, a NUMA policy. The inherited policy can be modified on a per-thread basis, and it defines the CPUs and even individual cores the process is allowed to be scheduled on, where it should be allocated memory from, and how strict to be about those two decisions. Each thread is initially allocated a “preferred” node to run on. The thread can be run elsewhere (if policy allows), but the scheduler attempts to ensure that it is always run on the preferred node. Memory allocated for the process is allocated on a particular node, by default “current”, which means the same node as the thread is preferred to run on. On UMA/SMP architectures all memory was treated equally, and had the same cost, but now the system has to think a bit about where it comes from, because accessing non-local memory has implications on performance and may cause cache coherency delays. Memory allocations made on one node will not be moved to another node, regardless of system needs. Once memory is allocated on a node, it will stay there. Run the program on a particular node or set of nodes, in this case that means physical CPUs (--cpunodebind=nodes) or on a particular core or set of cores (--physcpubind=cpus). 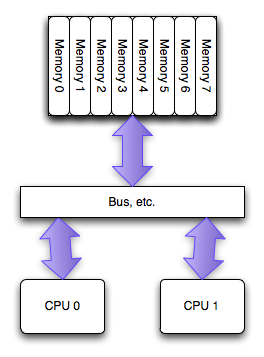 InnoDB, and really, nearly all database servers (such as Oracle), present an atypical workload (from the point of view of the majority of installations) to Linux: a single large multi-threaded process which consumes nearly all of the system’s memory and should be expected to consume as much of the rest of the system resources as possible. In a NUMA-based system, where the memory is divided into multiple nodes, how the system should handle this is not necessarily straightforward. 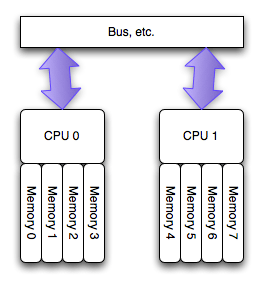 The default behavior of the system is to allocate memory in the same node as a thread is scheduled to run on, and this works well for small amounts of memory, but when you want to allocate more than half of the system memory it’s no longer physically possible to even do it in a single NUMA node: In a two-node system, only 50% of the memory is in each node. Additionally, since many different queries will be running at the same time, on both processors, neither individual processor necessarily has preferential access to any particular part of memory needed by a particular query. 2aaaaad3e000 — The virtual address of the memory region. Ignore this other than the fact that it’s a unique ID for this piece of memory. default — The NUMA policy in use for this region. anon=number — The number of anonymous pages mapped. dirty=number — The number of pages that are dirty because they have been modified. Generally memory allocated only within a single process is always going to be used, and thus dirty, but if a process forks it may have many copy-on-write pages mapped that are not dirty. swapcache=number — The number of pages swapped out but unmodified since they were swapped out, and thus they are ready to be freed if needed, but are still in memory at the moment. active=number — The number of pages on the “active list”; if this field is shown, some memory is inactive (anon minus active) which means it may be paged out by the swapper soon. N0=number and N1=number — The number of pages allocated on Node 0 and Node 1, respectively. The sheer imbalance in how much memory is allocated in Node 0 versus Node 1. This is actually absolutely normal per the default policy. Using the default NUMA policy, memory was preferentially allocated in Node 0, but Node 1 was used as a last resort. The sheer amount of memory allocated in Node 0. This is absolutely critical — Node 0 is out of free memory! It only contains about 32GB of memory in total, and it has allocated a single large chunk of more than 30GB to InnoDB’s buffer pool. A few other smaller allocations to other processes finish it off, and suddenly it has no memory free, and isn’t even caching anything. Due to Node 0 being completely exhausted of free memory, even though the system has plenty of free memory overall (over 10GB has been used for caches) it is entirely on Node 1. If any process scheduled on Node 0 needs local memory for anything, it will cause some of the already-allocated memory to be swapped out in order to free up some Node 0 pages. Even though there is free memory on Node 1, the Linux kernel in many circumstances (which admittedly I don’t totally understand3) prefers to page out Node 0 memory rather than free some of the cache on Node 1 and use that memory. Of course the paging is far more expensive than non-local memory access ever would be. Now, when MySQL needs memory it will allocate it interleaved across all nodes, effectively balancing the amount of memory allocated in each node. This will leave some free memory in each node, allowing the Linux kernel to cache data on both nodes, thus allowing memory to be easily freed on either node just by freeing caches (as it’s supposed to work) rather than paging. Performance regression testing has been done comparing the two scenarios (default local plus spillover allocation versus interleaved allocation) using the DBT2 benchmark, and found that performance in the nominal case is identical. This is expected. The breakthrough comes in that: In all cases where swap use could be triggered in a repeatable fashion, the system no longer swaps! The zone_reclaim_mode tunable in /proc/sys/vm can be used to fine-tune memory reclamation policies in a NUMA system. Subject to some clarifications from the linux-mm mailing list, it doesn’t seem to help in this case. Spread the buffer pool across all nodes intelligently in large chunks, or by index, rather than round-robin per page. Keep the allocation policy for normal query threads to “local” so their memory isn’t interleaved across both nodes. I think interleaved allocation could cause slightly worse performance for some queries which would use a substantial amount of local memory (such as for large queries, temporary tables, or sorts), but I haven’t tested this. Managing I/O in and out to/from the buffer pool using threads that will only be scheduled on the same node that the memory they will use is allocated on (this is a rather complex optimization). I have no idea if any of the above would really show practical benefits in a real-world system, but I’d love to hear any comments or ideas. Update 1: Changed the link for “Rik van Riel on the LKML — A few answers and proposal of the Split-LRU patch.” to be a bit closer to my intention. The old link points to the message that started the thread, the new link points to the index of the messages in the thread. Update 2: Added a link above provided by Kevin Closson about Oracle on NUMA systems. Update 3: I should have included a warning about numa_maps. Simon Mudd notes correctly that reading the /proc/pid/numa_maps file stalls the pid process to generate the data it provides. It should be used carefully in production systems against mysqld as connection and query stalls will occur while it is reading. Do not monitor it minutely. 1 Using free shows some memory free and lots of cache in use, and totalling up the resident set sizes from ps or top shows that the running processes don’t need more memory than is available. 2 An article in Dr. Dobb’s Journal titled A Deeper Look Inside Intel QuickPath Interconnect gives pretty good high level coverage. Intel published a paper entitled Performance Analysis Guide for IntelÂ® CoreTM i7 Processor and IntelÂ® XeonTM 5500 processors which is quite good for understanding the internals of NUMA and QPI on Intel’s Nehalem series of processors. 3 I started a thread on the linux-mm mailing list related to MySQL on NUMA, and there are two other threads related on zone_reclaim_mode and on swapping. Posted on September 28, 2010 by Jeremy Cole. This entry was posted in InnoDB, Linux, MySQL. Bookmark the permalink. With LoseThos, I originally set aside some memory for each core’s heaps because I was worried they’d fight for access. I think I assumed there was a problem where there was none. It’s a whole lot nicer with all cores allocating from one pool, not worrying about partitioning memory. Really informative and interesting read. Thanks (add a flattr button so that I can donate some beer money). Are you sure that “Memory allocations made on one node will not be moved to another node, regardless of system needs”? This paper (http://www.kernel.org/pub/linux/kernel/people/christoph/pmig/numamemory.pdf) from 2006 makes it sound like a done deal. Was “memory migration” pulled? Nathan: My understanding is that while page migration is *technically possible* it will never occur automatically. Perhaps I should say that “Memory allocations made on one node will not be *automatically* moved to another node, regardless of system needs”. My understanding, and what seems to be supported by that document as well, is that there are several manual interfaces to force movement of pages, but there is no automated logic anywhere to do it. Rik van Riel on the LKML â€” A few answers and proposal of the Split-LRU patch. Andrew: I guess the link wasn’t as clear as I intended it to be; Rik gets involved later on in the thread, but I figure you ought to read the context. I changed the link instead to point to the index of messages in the thread, so now it more closely matches my intentions. Very cool post, thanks Jeremy. The new InnoDB split buffer pool code should be modified to use numalib to allocate each of the smaller innodb buffer pools to use the local node. If you split the buffer pool into an even number of chunks, the entire buffer pool should be able to be allocated locally. Of course, you want to make sure you preserve space on each node for cache. I meant spread them across the local/remote nodes. Too early. How does one figure out if a machine is NUMA or SMP/UMA? This looks like it might be a problem we’re seeing, but I don’t know if this is it or not. Alan: You can use “numactl –hardware”; if you see more than one “node”, you’re on a NUMA system. Great writeup! Thanks for this. It sounds like NUMA memory-pool introspection would be a fantastic feature for top(1), if it doesn’t already exist. Thanks for sharing this! Great post! Nick: Using large-pages will keep mysqld from being swapped out, but it won’t keep the system from swapping *something* out. And, if it really needs memory on a particular node, and can’t swap out pages for mysqld, it will swap something else which might be more important to the function of the system, fail the allocation, or OOM-kill a process (likely mysqld). I have been working with Kevin Burton at spinn3r/tailrank for years and we did eventually solve the swap problem together but in a totally different way. Before I tell you how, first answer the question to your self: why would you ever *want* to swap on a server? We have come to the conclusion that we never want to swap at spinn3r; and I can’t come up with any good reasons for process on a server to swap at all. So we don’t have swap. I don’t mean that we turned swap off with swapoff; that has known problems which I believe have to do with the way the memory allocator tries to find free pages. ( Though there has been some work on this in 2010. ) What we did is compile out swap. This is an idea we got form a friend at google who apparently run all their servers in this way. Not only does this keep you from ever swapping it also speeds up the memory management as there is a whole set of bookkeeping the kernel no longer has to do. In this way we have a kernel that wont swap, and is faster, while still keeping important processes safe from the OOM killer. Jonathan: I think this makes sense if you have a sufficiently well-managed and carefully configured system, but I don’t think that’s a good solution for the general case. If you have swap either turned off or compiled out, that will disable memory overcommit, and severely limit how much mmap can be done, by my understanding. Jeremy: good write up. You’re nicely working counter to something I continually am asserting: “Nobody understands NUMA”. This is a very FAQ situation and the low on memory page could use updating for NUMA and zone reclaim. Especially as you’ve noted…most any system these days has NUMA effects and the allocation/reclaim behavior (and subsequent runtime performance) is only more complicated from a user perspective as a result. Another note on large pages: keep in mind that using large pages on linux _may_ in the very near future not keep mysql or other large page using apps from being swapped out. Depending on whether or not the transparent huge page patches merge in, there may be additional interesting runtime behaviors coming soon. Tim: Thanks for the comment. I read the Low_On_Memory page, and it was very helpful, although incomplete, it’s a great resource. Good point on the system behavior changing in the future. The key point of my research and solution is to solve the *problem* (that the system thinks it needs to swap) rather than the symptom (the swapping itself). Nice investigation. You mention that the NUMA code has parameters for the relative costs of local/remote access. But it sounds like it doesn’t use that information in making decisions. That should help automatically differentiate the two types of systems, and decide whether local swap or remote access is better for a specific allocation. We’ve migrated to using noswap kernels on all our boxes. Works well. Not a solution for everyone. I think your “An even better solution” is to run N mysql daemons (one per node) and then bind the memory allocations there. This has been my goal for two years now but we haven’t been able to do it in our stack (yet). The first change we’ll probably make is to do this to our robots which are a bit more shardable than our mysql boxes. Balancing memory is a good solution for about 70% of people but one major application won’t work well in this role. If you’re reading large chunks of memory at a time, and processing them on the LOCAL box, then your application will be slower as nr_nodes-1/nr_nodes of your pages will be non-local. For web applications where the biggest latencies are gigabit and CPU (and webapp) this probably won’t dominate though. You’d think that “swapping” to a NUMA node would be preferable to swapping to disk. Perhaps we’ll get this in the 2.8 series. Jeremy Cole: I am sure that removing swap dose not remove over commit. Over commit happens when the kernel believes that the a process wont actual need all the memory it has asked for; as a example when a process forks the kernel needs create copy of parents processes address space in the child but much of that memory will never diverge between the parent and child processes, so the kernel can use COW and over commit to make the memory use more effective. Compiling out swap dost not, and can not, turn off virtual memory. By the way if it was not clear I think this is really good and enlightening work you did hear, thanks. Ideally, it would be possible to track how many memory reads were local vs non-local. Obviously, you want non-local reads to be near zero. Ran into this issue a few years ago (custom proprietary high performance dbs). A lot of details aside, we felt most of these performance based memory issues came down to the software architecture. Running batteries of tests on many different systems, the optimal configuration was always 1 process per socket (physical CPU) and then threads on each core. This always gave us the highest throughput and the lowest latency. Going too far on either extreme (not enough processes vs too many) resulted in poorer performance and could leave you disk bound which is never fun. Not sure if you have this level of process/thread control in your mysql/innodb architecture. Obviously this is the direction hardware is going and keeping this in mind when data architecting will leave you with a lot of performance flexibility. Skip using a swap partition. Write a script to activate one when the system hits the rams limits. Matthew Rogers: I don’t think you’ve thought that through. When the system needs to swap, clearly it doesn’t have any memory available. Where’s it supposed to get the memory it needs to (a) detect that it’s out of memory, and (b) run a script to enable swap? The memory management under no-memory conditions is already marginal — it always takes a little bit more memory to free memory already. I’m interested in your assertion that turning off swap (via swapoff) is prone to problems with the memory allocator. Googling hasn’t helped me back this claim up, I’m wondering if you know where this is reported / documented / talked up about. Philip: My understanding is this: disabling swap completely disables memory overcommit, which can cause problems forking in large processes, amongst other things. This memory manager bug not documented any where as far as I know but I have discussed this with kernel developers and they are aware of the issue, but know one has given them a reproducible test case. There has been some patches in one of the last few kernels that might address this issue but I have not had a chance to test. Running with swap off seems to make the memory bug worse then compiling out swap. It would be interesting to see how other OS’s handle this scenario. Specifically how FreeBSD or Solaris deal with NUMA. Really excellent detective work, I’m not a MySQL user but it’s still very interesting. Have you tested much with the system booted with numa=off? It appears you are using a Nehalem EP system. You might just boot it in SUMA mode and see how it performs. Kevin: I haven’t done any testing thus far with the NUMA features disabled in the BIOS, but it would be interesting to try. Your articles are excellent — I will bring them up into my main article as another reference with more explanation about NUMA and big databases. It’s great to see a bit of the Oracle perspective on this. You could simply run a cronjob and when ram usage hits 80% allocate more space via swap or simply send an alert. I don’t even think you should run ANY swap space. If you system is running out of ram and is actively using swap during day to day operations the balancing is mis configured or your server is not sized properly. Matthew Rogers: Clearly you did not read the article. Try again. ??????????? » Blog Archive » MySQL??????swap??? This article really helped me improve mongodb performance. Perhaps you might want to make a version that is not specific to MySQL. Basically, this applies to any application that uses large amounts of memory. In LoseThos, I want one memory map shared by all CPUs. If a system does not have that, I don’t care about it. SWAPS/s on the wallpaper is how many times a task is changed. Wouldn’t using –preferred=node still give you the intended benefit of NUMA, while eliminated the problem described in the article? (I realize that your testing showed no performance degradation with interleaving, but I’m speaking hypothetically/theoretically). Thanks for this research – it finally puts to rest a big “huh? ?” that I’ve been keeping in the back of my head! Jonathan: Using preferred allocation wouldn’t help in this case because, since the total amount of memory being allocated is “most of the memory in the system” for a MySQL/InnoDB system, preferring any single node will surely run that node out of memory. Really great article. Do you have any recommendations on articles, tutorials or books (prefer any of those 3 to a newsgroup/mailing list) to understand more about linux memory management? This book is quite outdated (Published November 2005) but it is largely still relevant, and does a very good job of explaining the different subsystems, their purposes, and their interactions. As far as I remember, it doesn’t actually touch on NUMA at all (since it was not really relevant to most systems back in 2005). It does touch briefly on NUMA at the beginning of the Memory Management chapter (pages 297 and 298). I think that it has been added in the 3rd edition, so that’s maybe why you don’t remember it. This was a great article. Thanks for the read… I noticed that the “cpu#” seems to spread across all physical cpu’s, and then loop back again. Can anyone explain why ? I think this is largely a combination of the kernel code that enumerates CPUs, and the hardware itself. Does this also apply to high-memory VMs running on top of NUMA boxes? Good question. I’d guess it primarily applies to the host OS side of that equation, but I honestly don’t know what the interplay is between NUMA and the virtualization stuff. This explains a lot of oddness I’ve experienced. I am interested to see how this will be solved by the MySQL community. I agree that using libnuma is likely a good long-term approach. Istvan: Hah. Re-read the article, since you clearly skipped over it in your fervor to post something anti-MySQL, and you will notice that it is not really MySQL specific. Is this relevant if the memory allocated to mysql is less than even the total of 1 node in NUMA . For example, if i have 2 socket , system with 32 GB memory . and the total memory allocated to mysql is just 8GB . Why do I see only 1 node as if it was a UMA/SMP architecture? And if it was really a UMA/SMP architecture, why do you think I could be experiencing the same symptoms you describe here? i.e swapping memory with still a lot of memory available making mysql to have random delays in random queries. Bristolito: It looks like that system is either UMA (older generation) or may have NUMA “disabled” in the BIOS. In that case you should not see degradations related to the above, but could see swapping/degradation for other reasons. So if I have 2 physical sockets (6 cores each), 96 GB memory total and want to run 2 database servers on it. Does it make scenes to let each MySQL server run on it’s own node? Might be a very dumb question, but does the value of innodb_buffer_pool_instances have any impact on the –interleaved option? Would multiple buffer pools per node actually achieve the same effect, by making MySQL spread its memory demands more evenly in the first place? Or is it irrelevant in this discussion? I had the same thought and tested with innodb_buffer_pool_instances=8, which is the default in MySQL 5.6 or later(I tested in MySQL 5.5 though), and confirmed that it achieves the same effect exactly as you wrote. I also expected some performance increase thanks to the reduced contention and the all-local node memory access. But I didn’t see any apparent difference in performance. Not sure why. BTW, innodb_buffer_pool_instances is a relatively new MySQL configuration parameter (introduced in 5.5), and the author’s solution was probably the only solution when he was investigating the issue. Still an excellent article. Thank you. Thank you Jeremy. Very helpful with great explanations! Reblogged this on traversals of a schizoverted mind. Basically, it sets NUMA policy inside mysqld to interleave for all memory allocation performed before we start accepting connections (i.e. buffer pool, key cache etc) and then sets policy back to default. the idea being that since a mysql connection runs in a single thread, all memory it allocates will be for processing that connection/query and so it may as well be node local to where the thread is scheduled to run. This is a MUST read article, thanks for sharing! I am seeing following error in MySQL Cluster Data Node, do you think this is because of NUMA? cron.weekly issue #60: Debian, Vim, Gitlab, Jenkins, Piwik, Nginx, MySQL & more! Learn a lot from this blog. Thank you! I am quite curious about how do you know the memory swapped out is part of innodb buffer memory?